So you miss the old days when you used to plug a game cartridge into your video game console, and start playing. And even though technology has come a long way since then, a Japanese startup company by the name of Beatrobo is making a bet that you'd rather plug in a cartridge than load a game on your smartphone via the cloud. Company founder and CEO Hiroshi Asaeda said, "Sure, you can get Chrono Trigger on your iPhone, but it's just not the same." So Beatrobo has developed a game cartridge called the Pico Cassette. These puppies click into place using the 3.5mm earphone jack on an iPhone or Android handset. The cartridges don't store software. Instead, they act as an authentication key that works in conjunction with apps loaded on your phone, by using an inaudible sound. The Pico Cassettes communicate with Beatrobo's servers. 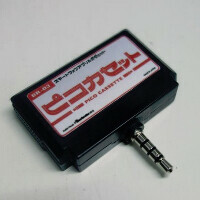 Each cassette has a unique identifier that allows games to be stored in Beatrobo's servers. This way, you can start a game, switch devices, and not miss a beat. The company is counting on game players feeling a sense of ownership with the physical cassettes. That is something that they might not have when storing a game in the cloud. At the Tokyo Game Show, where the system was displayed, the only game available was a Flappy Bird-like title. Obviously, licensing a number of games will be a major priority for the company. The cassettes are expected to sell for $15 each once the system launches. When that will be, no one has a clue right now. Now this some interesting concept, hope there would be more game developer supporting it, kinda disappoint that there is some games won't allow store game data between different OS. I like physical media for the sense of ownership and value but this just isn't that because it's still all digital and you only own the game as long as that company exists and says you own it. What an stupid idea, maybe it will work in Japan because they like gadgets. But why carry these things around while you can download roms! That's just fake. A real cartridge loader for old Atari and Nintendo games would be fun. Let me start off by saying that I am an absolute sucker for classic video game cartridges and owning physical copies of things (CDs, DVDs, etc.). I even prefer to by my 3DS games in cartridge form. With that said... this is a really stupid idea. This is one of the stupidest ideas I've ever heard. I get the love of carts, but nobody ever asked for this.